Freckles dotted her skin like punctuation on the chalkboard during an English lesson. She had thick, frizzy hair; the color and texture reminded me of Little Orphan Annie’s hair, curls unfurled. Her name was Miss Hudik, and my fifth-grade class was her first when she began her career at Center Road Elementary. She assigned a short story with illustrations. I wrote a tale inspired by The Red Balloon, an award-winning children’s film directed by Albert Lamorisse. On a rainy fall day in France, Pascal finds a balloon, round and red. The balloon, which has human qualities, is a companion to lonely Pascal until his jealous classmates steal it. One of them hits it with a slingshot. 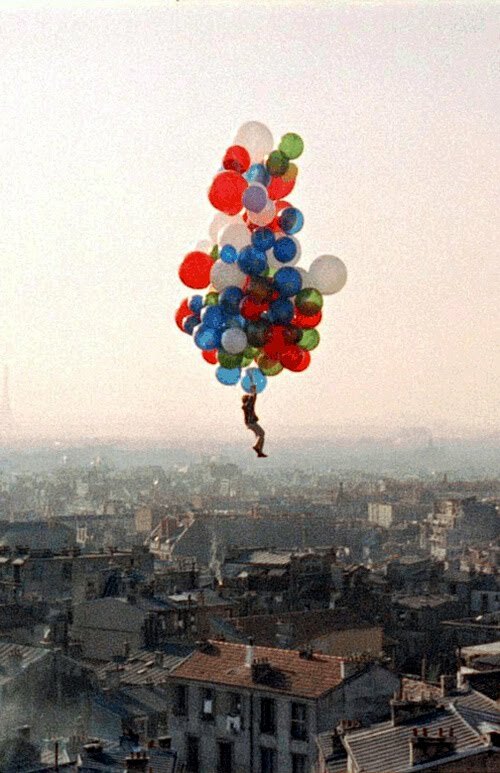 Hundreds of balloons escape, fly to Pascal, wrap their strings around him like a harness, and lift him in the air. This is where the idea for my first story came from. My character, Holly, flew in a red hot air balloon with a brown woven basket, despite her fear of heights. Various situations threatened to pop the balloon. She landed unharmed, a braver girl. I used 11” x 14” white paper, folded in half to look like a book, silver staples at the seams. I traced lines with a ruler, four to a page; I printed my best handwriting with a black crayon. Above the words, I drew a stick figure with yellow pigtails and blue eyes, the sun, clouds, V-shaped birds. When I wrote my name on the cover, I felt, for the first time, like a writer. A red balloon inspired me to create; a red-haired woman encouraged me to continue. She gave me the guts I needed to write on my own. Miss Hudik was my last childhood teacher. She sent me into junior high, and the rest of my life, armed with the core of my identity: writer. What you just read is an essay I wrote in 2005 that won second place in the Lea Leever Oldham essay contest. The late Lea Leever Oldham founded the Western Reserve Writers’ Conference, held each March and September at Lakeland Comminuty College. The topic in 2005: When did you first know you wanted to be a writer? I invite feedback from everyone, and for the writers, an additional question….when did you first know you wanted to be a writer? For a long time, I have envisioned myself in a flannel shirt, in a cabin in the woods, writing in my old age. I have the flannel shirt, I have the cabin and I am old, but I can't quite focus on only writing. I love so many of the arts. What I really need to do is give the blogging thing a rest and work on my one-woman show. Maybe I will. Thanks for inspiring me. Hi Kass! Thanks so much for reading and your comments! I see you have four blogs, and with so much out there to read and do and keep up with, along with doing your own writing, it can be overwhelming. I think there's a balance, as there is with all other things, and it's always a journey to find the balance. I'm sure spending some time in your cabin (lucky you, your own cabin!) writing in your flannel shirt and focusing on your own writing would be nothing but good, and you could find time for your blogging too. Whatever you end up doing, I'm happy to hear you were inspired, and best of luck to you!! Happy New Year! Thank you for sharing your essay Alanna! As a little girl, I wrote stories during my countless visits to my Grandma's house. She had helped me learn to read and her encouragement and praise led me to love to write. As a little girl with two older brothers, I wrote many stories about sisters and I had a phase where I wrote about twin sisters. But whatever I wrote, my Grandma consistently provided the space, silence and patience for me to write. I first knew I wanted to be a writer, curled up in my her brown rocking chair, surrounded my Grandma's love. Hi Jenny! Thanks for reading and sharing your comment! I love what you say about your grandmother providing the “space, silence, and patience” for you to write. That's so important for all writers. What a beautiful story, thanks again for sharing! Alana – after seeing your replay to my comment and actually seeing in print, “You have four blogs…,” it made me realize I didn't WANT to have 4 blogs so I dropped 2 of them. Thanks, you've helped me to focus. Hi Kass! Thanks for your comment! I'm happy to hear I could help you focus! I am also glad to hear that you did keep 2 out of your 4 blogs, as I enjoy reading your stuff! I know I have a hard time focusing, too! There's so much we want to do and just not enough hours in the day.